Nebraska Ag Water Management Network (NAWMN) is a collaborative group of farmers, crop consultants, NRD personnel and UNL Extension Educators that work together across the state of Nebraska to adopt water and energy conservation practices. This is done by using simple WATER BUDGET equation. To keep up with WATER DEMAND (crop water use) we need to receive equivalent amount of moisture on WATER SUPPLY side of the equation, which includes soil available moisture, rain, and ultimately irrigation. Unfortunately, we can only control irrigation component of this equation. In the following paragraphs I will discuss how we can use newer technologies how to make every inch of water applied through irrigation to produce yield. This summer SW Nebraska adds about 15 locations collaborators (farmers and crop consultants) from Perkins, Chase and Dundy Counties to more accurately estimate WATER DEMAND (crop water use). 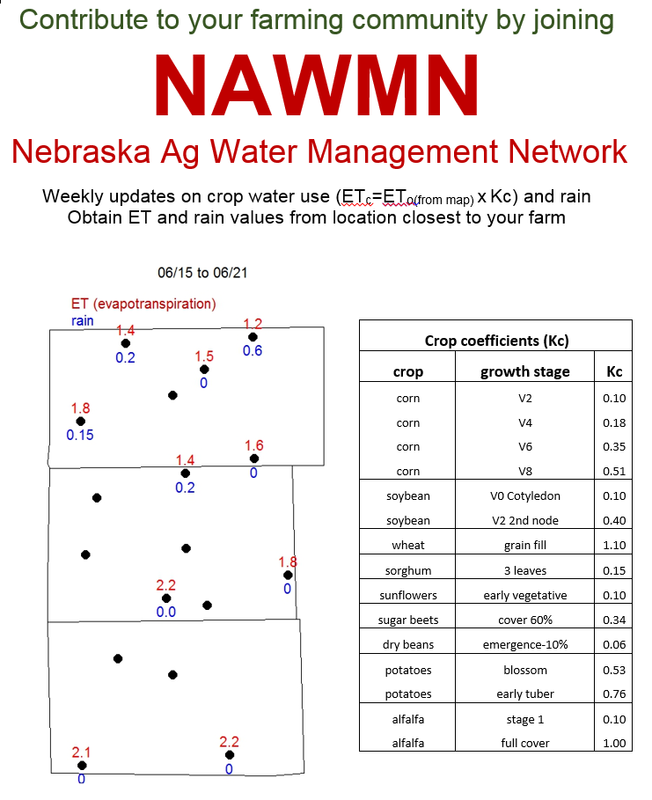 Map of potential evapotranspiration (ETo) will be posted weekly in your newspaper, on radio, water.unl.edu website, on this blog, or twitter @agwithstrahinja. To estimate crop water use or crop ETc look at the map provided, obtain weekly ET value from location closes to your farm and multiply that value by crop coefficient provided in the table. Assuming your soil has enough moisture on the supply side this is how much water your crop used in a past week. To accurately estimate WATER SUPPLY, first you need to know how much rain you received in the past week. Along with ET values we also provide rain data. However, keep in mind that rain can very much more from one place to other then ET. Second, you need to know water holding capacity of your soil. For example, silt loam soil can hold 2.2 inches/ft while loamy sand can only hold 1.1 inches/ft. Research showed that plants start to loose yield due to water stress after soil water is more than 50% depleted. Therefore, in silt loam soil you have about 1.1 inches/ft more to manage then in loamy sand (4.4 inches if 4 foot profile). Chart with waterholding capacities of different soil type and trigger levels for irrigation can be downloaded here. Second, you need to know how much water you have in your soil, and soil moisture sensors can help you with that. UNL did research that enabled us to use readings from Watermark sensors (in cb) and convert to inches/foot. Watermark sensors are very affordable (about $35 each) and accurate, and over years we learn to trust them. More about using Watermark sensors click here. Example for irrigation scheduling based on ETc. Last week corn started with soil at field capacity and now is at V8 growth stage and it used 0.7 inches of water based on weekly reference ETo (1.5 inches) x crop coefficient Kc for V8 corn (0.5). Corn is grown on loamy sand that has waterholding capacity of 1.2 inches/foot, and at this time corn rooting depth is 2 foot. We want to keep our soil above 50% depletion to avoid water stress; thus, we have 1.2 inches in top 2 foot to manage (0.6 inches/foot x 2 foot). There was no rain last week, so there is 0.5 inches left in soil profile (1.2 inches/soil profile – 0.7 inches for ETc). In hot summer day corn at V8-V10 stage can easily take up 0.5 inches in 2 days; therefore, in this scenario (assuming there is no water allocation) irrigation is recommended to avoid water stress.